Stranger can most easily be described as that amazingly unbelievable, mystically quantifiable, outrageously viable reggae-rock band you haven’t heard yet. Fresh off the burner of an insanely successful EP release last month at the House of Blues San Diego, the band looks forward to blowing the roof off every venue on their ever-growing tour schedule. With their amazing live show and loyal legion of fans, Stranger will win you over sooner or later; it’s just a matter of time. It is my absolute pleasure (and responsibility as a music lover), to bring you this exclusive interview. On Wednesday February 6th, 2013, while the northeast was busy preparing to face the storm of the century, I was sitting outside New Break Coffee Co. in Ocean Beach, CA, watching palm trees gently wave back and forth and preparing to interview David Ornelas and Don Carter of Stranger. How excited are you about the new EP release? David: Extremely stoked! We just did the House of Blues for our EP release show, and it was epic. The EP was a year in the making at our home studio, and it’s just really cool to hear something that feels homemade. The home studio is something all musicians would love to have, how long have you had yours? David: We built it in 2009. I started recording using Pro Tools in 2007, and have sort of been building up the confidence to do a whole album... finally it came to fruition. What is your writing process for albums? Is there a typical approach you guys have or is it a free-for-all from six amazing musicians? David: It goes song by song, ya know? Sometimes it will start as a jam we like at practice, sometimes it will start with an idea, like a melody, or sometimes with chords. One of the songs on the record, I had this idea of a melody, and I was just jabbering it, like not even saying real words. We liked it, so later I wrote words around the sounds I was putting out. It’s all inspiration, no matter what angle it comes from. You guys are known for your live show, what is your favorite part about performing? David: For me it’s just the moment. Whoever’s there to witness gets to enjoy it, and it will never be seen or experienced that exact way again. What is the craziest thing that has ever happened to you on tour? Don: (Laughing) None of my stories are appropriate. David: (Laughing) Marriage proposals. A lot of people ask us to jump on stage, and propose or whatever. And sometimes, well... it just doesn’t work out how they think it will. Our sax player did propose to his wife on stage at one of our shows... that was a good one. What inspires you to do music for a living? David: It’s my balance. It’s a healing thing. If you love what you do, and do what you love, it will payoff. David: I started when I was 14, I was DJing and really into house music. You know, we were just a bunch of high schoolers trying to rap and stuff. But when I found reggae, I just had a connection with it. I loved the rhythm, the message, and just how it made me feel overall. What was one artist you listened to that changed your life? For people who haven’t heard of Stranger before, what should they listen to? David: Well we’re really proud of our new EP, and already working on other new stuff to record. But overall, I’d just like to get everyone to a show... the vibe of the band is in the live shows. It’s crazy, I don’t know how to explain it, but everything just comes together there. David: Thank you! Thank you so much! 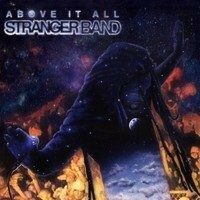 Be sure to check out the album review for Above It All by clicking here.